The last big holiday of summer in the US is here! Whether you're just spending the long weekend relaxing with your family or you're throwing a Labor Day party for friends, here's a no-fuss recipe that you and everyone else will surely enjoy! 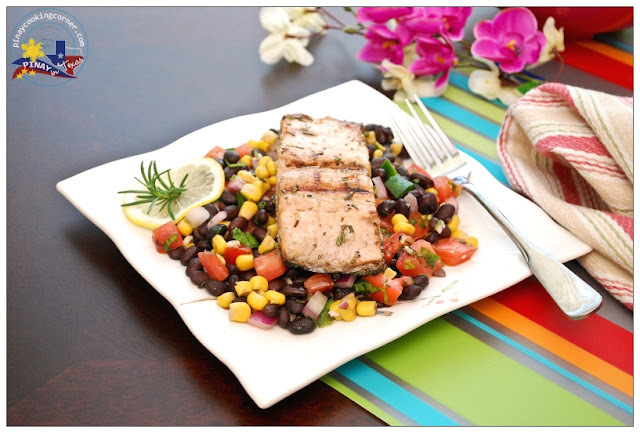 It's grilled salmon paired with black bean salsa. I got the very easy salmon recipe from pillsbury.com over a year ago, and my family enjoys it so much! It takes little preparation, few ingredients, but the result is so delicious and flavorful! 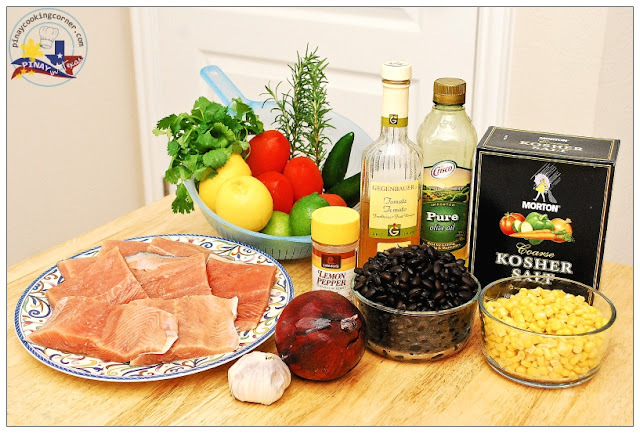 The black bean salsa, on the other hand, is my version of a favorite Mexican side dish. It is also very quick and simple to prepare. Just toss everything in a bowl and you'll have a delicious side dish in no time! I used freshly cooked black beans and corn, but canned or frozen ones will work fine too! And for the corn, you can also use grilled corn for added flavor. My daughters just don't like it so I stick with freshly boiled corn cut off the cob. 1. Sprinkle salmon with salt on both sides. In a small bowl, combine the other ingredients except for the lemon pepper and mix well. Set aside 2 Tbsp mixture for basting. Place the salmon, skin-side down, in a baking dish. Brush the marinade over the top and sides of fish. Let stand at room temperature for 15 minutes. 2. Meanwhile, combine all salsa ingredients in a medium bowl. Stir to mix well. Set aside. Refrigerate until ready to serve. Prepare the salsa ahead of time so you will have enough time to refrigerate before serving. 3. Brush grill with olive oil and heat up to medium low. When ready, remove salmon from marinade. Arrange the salmon on the grill, skin side down. Sprinkle salmon with 1 tsp of the lemon-pepper seasoning. Cover grill. Cook for 4 minutes, brushing occasionally with reserved marinade. Carefully flip over and sprinkle with remaining 1 tsp lemon-pepper seasoning. Cook an additional 4 to 8 minutes or until fish flakes easily with fork. Serve with salsa. Nice refreshing recipe. Perfect for weekend :D.
What a beautiful presentation this dish makes! The flavor combinations are outstanding! Thank you for sharing. Oh, this looks like my idea of the perfect holiday meal...two of my favorites in one post! 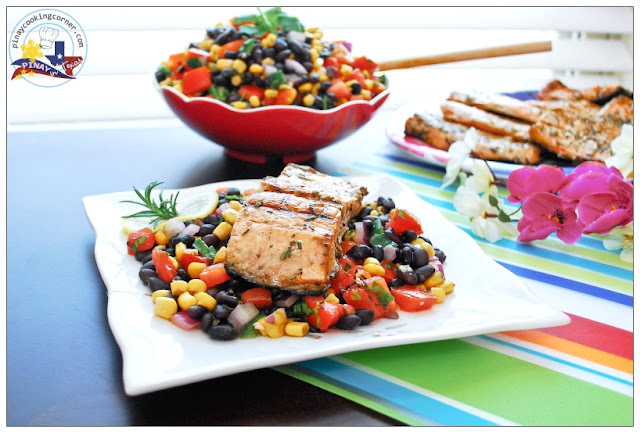 The grilled salmon recipe looks simple, yet flavorful and I've never met a black bean salsa that I didn't adore. Have a great holiday weekend, Tina! I like salmon, another great recipe how to prepare it! Love this meal!! 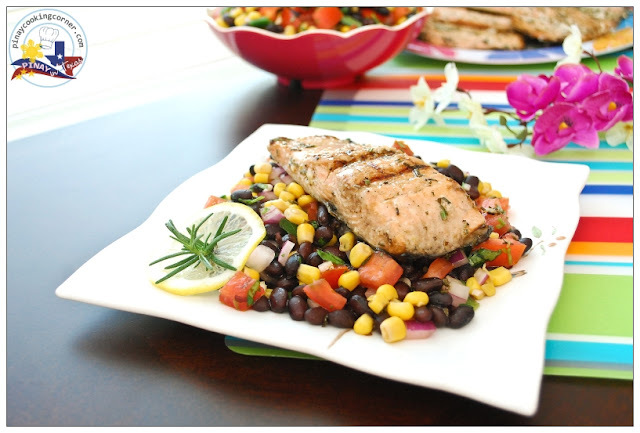 Great seasoning and salmon and a great complement of the black bean salad! I could eat this every night! Oh my, this is a perfect meal for me today. 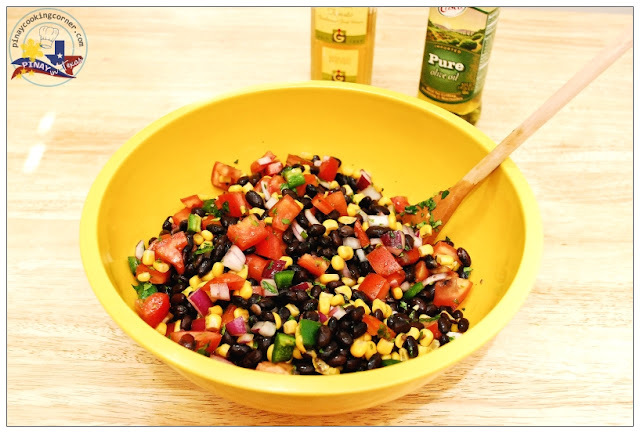 Black bean salsa look great with salsa. I have at least four types of vinegar in my pantry but tomato vinegar, I am reading it for first time. Does it taste like tomato juice? It tastes like apple cider vinegar, Balvinder. So delicious looking - I like the unexpected pairing of rosemary with a black bean salsa.